I wasn’t planning on doing a post today as, no to offense WordPress, I thought the prompt stank. I also had a rough morning with every muscle in my body extremely tight. Tomorrow will probably be better, at least. I was feeling sorry for myself, I’m ashamed to say. His timing is uncanny! I opened Facebook and, well, let me set the scene. I’m involved with a charity that provides with Free Wheelchair Mission, a nondenominational Christian charity that provides wheelchairs to the physically disabled all over the world. The people they help have literally spent their lives in bed, or crawling on the ground. Once a year they have a gala, which is the big fundraiser for them. This year I think they raised a million dollars. Dad and I attended the event in July. I knew there was going to be a guest speaker, but didn’t expect to be as inspired as I was. 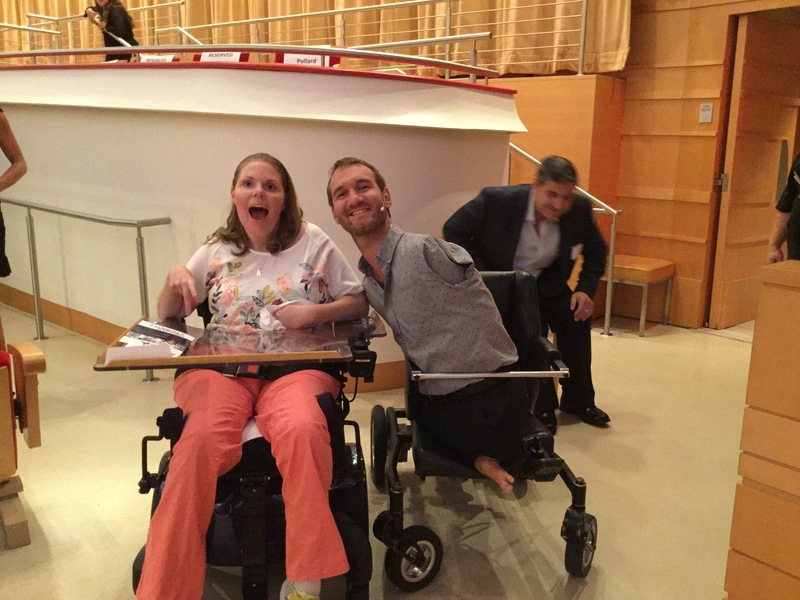 Nick Vujicic was born without arms or legs. You would think he had no quality of life, having no limbs. What was so inspiring was, he went from being suicidal as a teenager to now traveling all over the world advocating for the physically disabled. He has gotten presidents and kings to change their laws regarding the disabled and bought accessible homes for people. Back to Facebook. I now follow him, and get posts every so often. During my self pity I opened my page, and there was a post from Nick. It was my reminder about how stupid I was being. How dare I feel sorry for myself! He has the best attitude, even without something I take completely for granted: arms and legs. I don’t have to wait for tomorrow to be a better day; it’s already happened. Dear God, the letter read I came across on my jog. I felt nosy reading some child’s correspondence with The Big Guy. I found it endearing, but it also troubled me. As a postal worker, I knew what would come of it. Dead letter pile. I couldn’t let that happen. With two parents out of work and a brother with cancer, this youngster needed some help! Back home, I called my boss. I explained the situation. “We’re really not hiring,” he said, “but we can find something.” Another call, remembering our church secretary just quit. He works in mysterious ways.